This month's Japan Times article is about umeboshi, the sour-salty pickled fruit (usually called a pickled plum, though it's actually more related to an apricot) that's practically a national symbol. I've written quite a lot about umeboshi on these pages before of course, including how to make your own if you can get a hold of the fresh ume fruit, following my mother's instructions. This time though I've gone a bit more into my memories of this sour-salty treat growing up, as well as its symbolism. The picture you see at the top of the article is of a hinomaru bento - a bed of white rice with a single umeboshi. It looks rather like the Japanese flag, which is called the hinomaru, thus the name. The hinomaru bento has been alternately a symbol of poverty, and a symbol of wealth. During times of peace and plenty, it was a symbol of poverty; if you could only afford to eat rice and not much else, you could somehow get the rice down with the help of an umeboshi. Even looking at an umeboshi could help, since it got the salivatory glands going. But in times of war, rice itself became a precious commodity. All domestic rice production was reserved for feeding the army during WWII, and while the rich and influential could get their hands on some, regular people had to make do with other grains like millet. After the war, rice was imported from Southeast Asia to make up for deficiencies, but people hated the gaimai (rice from 'outside') that was so different from the type of rice they were used to. (See Looking At Rice.) So a hinomaru bento with 'real' japonica rice was a coveted luxury. Nowadays of course we live in times of plenty, and that extends to the umeboshi. Not that many people make their own umeboshi anymore in Japan - and why should they? The variety of umeboshi you can get just about anywhere is staggering. 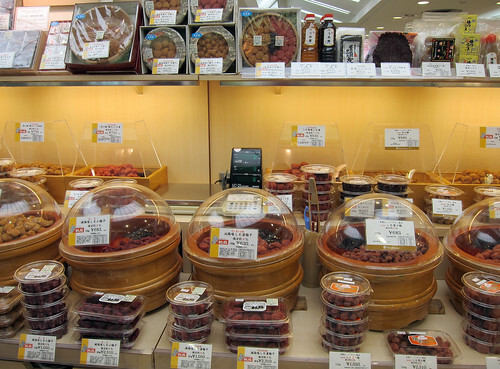 This is the umeboshi display at a typical Tokyo department store food hall. 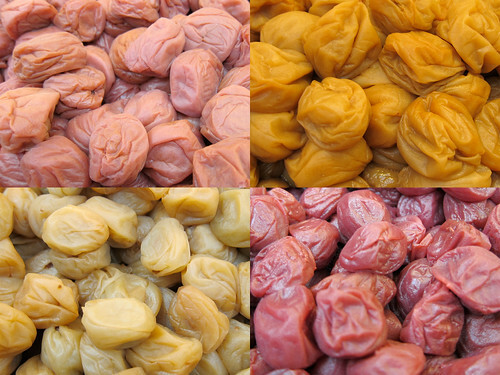 And here are various kinds of umeboshi on sale. Some are low-salt, some don't use any red shiso (perilla), some are marinated in dashi stock, and so on. Prices vary wildly too. You can get a packet of serviceable umeboshi for 100 yen, at the 100 yen shops like Daiso or Lawson 100, or ultra-gourmet varieties that cost 500 to 700 yen and more per umeboshi. Submitted by maki on 2012-05-25 12:18. Friends of mine on Kaua'i make their own umeboshi. Two kinds, small crunchy and larger delicious ones, were given to me in sealed bags when we left the island last year. Both kinds are wonderful. After tasting these, I threw out the jar of salty bitter commercial ume in my refrigerator. No comparison! Yes, Maki, your energy level will be low for many weeks yet. Though the radiation treatments have stopped, your body is still fighting the effects of the attack on whatever stray cancer cells might have remained after surgery. My doctor described the radiation as "sterilizing" the area. There's no use trying to return to your normal activities right away -- or expecting that you should be able to. It will take time to get your energy back. You WILL be well again, but please recognize that you are still healing and the pace of progress is slower than you wish. I know. Take your naps. Think serene thoughts. Be patient. With all good wishes for your recovery. I've been to Japan twice and have yet to actually try an umeboshi. I've often looked through the large selection at Uwajimaya but the foodie in my glances at the ingredient list and puts them back. All of them seem to have added MSG and other artificial preservatives/colorings/flavorings. Are they like that in Japan too? What's an American to do? Marinating umeboshi in dashi stock, or adding MSG to it (in the case of cheaper brands) is an unfortunate trend IMO. In Japan you can get plenty of different kinds of umeboshi, including ones with no dashi/MSG. I prefer those. I get Umeboshi at Uwajimaya. They have a pretty good selection compared to anywhere else in the states. Homemade is always better, of course, but I'm pretty fond of the ones that are just labeled "Aka Shiso." Also, when I lived in Japan, the only way I was able to try the homemade kind was when I went to a sake bar with some friends and I started eating the umeboshi out of the ceramic container on the table. The owner of the bar was thrilled that I adored her umeboshi and she gave me an enormous bag to take home, which lasted for the rest of my stay (6 more months at that point, I think). Maki, you humble me with your honesty about having had cancer and your recovery from the operation and treatment. I hope you will feel and get stronger, sooner than expected. May you have only a fading memory of the trials of this time in your life, a few months from now. Thank you for your articles. No one I have read is going to complain or put pressure on you to do anything but heal and feel loved and appreciated. I love pickles, although until recently I haven't liked Japanese pickles. I gradually started eating the cucumber ones with rice, and eventually my love of sour things overcame the strange flavor and I love them! The same thing happened with umeboshi. I have no had them whole and round like in the picture, just ones at that are sliced and purple in sealed bags, probably not the best. I wonder if I can eat the good ones, too. I hope so. You've got a lot of courage, Maki :) Thanks for writing this, and all of the effort that went into the photos and editing. I enjoyed your article, and learned the name of the Japanese flag too. Thanks! I love umeboshi as it's used in some of the Japanese restaurants around here, but can't usually get it in stores. Recently I found one store that sells that (at rediculously high prices) but it was so salty that I felt like it burned a hole through my tongue... is that normal and did the restaurants have some variation, or is it really not supposed to be that salt??? Umeboshi come in many levels of saltiness. If you find ones you bought too salty, you can de-salinate them a bit by soaking them in a weak saline solution (which draws out the salt better than plain water). Or, just use the umeboshi as a flavoring in lieu of salt. Ah! My Canadian-born sisters and I used to have umeboshi eating contests with the really sour ones! just pop one in the mouth and slowly let it dissolve. Eye-watering, but delicious. My mom would crack open the seed and let us eat the soft pickled innards. Like you, I associate umeboshi with childhood. Even now, when i get sick all I want is rice porridge and umeboshi. I hope you start feeling better soon. Thank you for the update. Taking life one day at a time, can be so trying. Sending loving thoughts your way, feels inadequate, please know I care. Visiting Japan recently I was overwhelmed by the breakfast spread at an onsen hotel and lamented to the 仲居さん(the person looking after us) that I couldn't finish the really delicious rice. "Why don't you use it to make onegiri, I'll fetch some more umeboshi, that way it won't matter how hot it is in the coach" she kindly suggested. Round the room the others caught on and we had an impromptu ongiri making lesson and explanation of umeboshi. Such moments are precious when traveling. Thank you for the ume-dashi dressing recipe in the Japan Times article. Went to see the documentary film "Jiro Dreams of Sushi" during the week (trailer can be seen on film's official site) and commend it to your readers. I hope progress continues in your kitchen. Thank you for your articles! I wait for the day you are back to your old self, till then, rest if you must, I will still check back for your articles even though they may be less frequent! Thanks for showing the variety of umeboshi! My mother in Hawaii received a gift box of umeboshi from Japan where each one was individually wrapped and was flavored with honey. Oh it was so delicious. Unfortunately, can't find that here where I live. On a separate note, Maki, my feng shui master has also studied qi gong and tai chi for over 40 years. He taught me breathing exercises to increase energy. Please try this. Rub your hands together and place next to your belly button. Then inhale expanding your stomach, pushing your hands out, then exhale, with the motion of gently pressing the air out of your stomach until you release as much air as possible. When our bodies are not well, our breathing is shallow, this exercise is to help increase our oxygen intake. Wishing you to get better soon. We're all out here Maki, loving you and your articles. I wish you all the best and a full recovery from your battle with cancer! But getting back on topic, the ume tree is in many ways an even older symbol of Japan than the tree that produces sakura blossoms in spring. For one thing, ume blossoms open about a month earlier than the sakura blossom, and is considered the first sign of the coming of spring in Japan. I'd rather enjoy an umemi occasion with ume blossoms--less crowded, for one thing. I've eaten both sushi and onigiri wrapped around umeboshi and the taste can be a bit of an acquired taste for some Westerners (salty and sour combined is something most Westerners are not used to). Interesting tidbit: one reason why metal bento boxes for many years had short usable lives was the fact the acid from umeboshi would literally corrode the metal of the box itself. 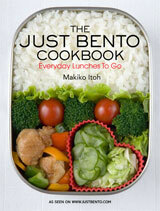 I'm not sure if a modern bento box has solved that problem, though. Maki, no need to stress over anything, just get well ! 1. I really enjoyed the umeboshi article. I first ate them when I worked at a macrobiotic retaurant in Boston USA many years ago--we were told they were good for digestion and also that if you put them in onigiri, it would help them stay fresh. 2. Your body has been through a tremendous assault, and needs lots of rest--but this too will pass. I had the full slash/poison/burn routine for breast cancer five years ago, and now I can scarcely remember the side effects anymore, though I do recall many nights when I went to bed at 6 or 7 o'clock. I wish you the best with your healing and good health in the future! I have to admit, I hated the first umeboshi I tried; and I hated the next one and the next one as well. But I ate a lot of bento, which always seem to have an umeboshi on top and I could never help eating it, despite not liking it. After a few months of contorting my face every time I bit into an umeboshi, I started to get used to the taste and eventually I even came to like it. By the last year of my three year stay in Japan, I was actually buying those little plastic tubs of umeboshi you have oictured above as a snack. I left Japan in 2006, but still find myself occasionally craving a few umeboshi. Your article didn't help; I really wish I had a tub of them right now. Ah the umeboshi, an inspiration for my blog. To tell a family secret, I've never been too keen on the thing, but also had no idea that there was such a breadth of recipes. Though, IMO it's not nearly as tough to become friendly with as Indian lemon achar. At the same time, extracting the umeboshi flavor might go well with rice or a vegetable. I just recently discovered your site and it's been a wonderful resource... so thank you! I learned to make onigiri from your posts on the subject.